Abtech hazardous area (ATEX and IECEx) electrical enclosures and junction boxes for Zone 1 and Zone 2 installations include stainless steel, GRP, aluminium and polycarbonate ranges. Specialist application junction boxes and enclosures include submersible enclosures, fire rated enclosures, deluge proof enclosures and high voltage electrical enclosures. Hawke manufacture a complete range of hazardous area EExe GRP and EExe stainless steel enclosures and junction boxes certified for Zone 1 and 2 areas (ATEX). T&D UK distribute from stock Hazardous Area (ATEX Zones 1, 2, 21, 22 Certified) EExd Flameproof & Explosion Proof and EExe Increased Safety electrical enclosures and junction boxes. Zone 22 - a place in which an explosive atmosphere, in the form of a cloud of combustible dust in air, is likely to occur in normal operation but, if it does occur, will persist only for a short period. 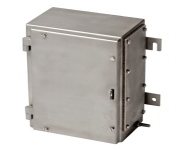 Flameproof Ex "d" Electrical Enclosures & Junction Boxes - electrical equipment may include arcing and sparking (incendive) devices and flammable mixtures which may enter the enclosure or junction box. The electrical enclosure construction is designed to contain an internal explosion and prevent transmission of sufficient energy to ignite a potentially flammable atmosphere outside the enclosure or junction box. Increased Safety Ex "e" Electrical Enclosures & Junction Boxes - explosive mixtures may enter the electrical enclosure but the likelihood of a fault condition, which could result in ignition of the mixture, is significantly reduced. The components within the electrical enclosure or junction box shall not produce arcs, sparks or temperatures above that of ignition temperature of the surrounding atmosphere in normal working conditions. Minimum ingress protection IP54 for increased safety electrical equipment.